Many of London’s vulnerabilities to climate impacts stem from its urbanisation, which can reinforce climate impacts; for example by preventing the city from cooling off on hot summer nights and increasing the rate of rainfall run-off, leading to flash flooding. A significant proportion of London’s critical infrastructure is already at risk of flooding and/or overheating. Buildings and their urban environments have evolved to enable some control over climatic variables, and there is also a perception that cities provide an ‘urban advantage’ in comparison to rural areas. 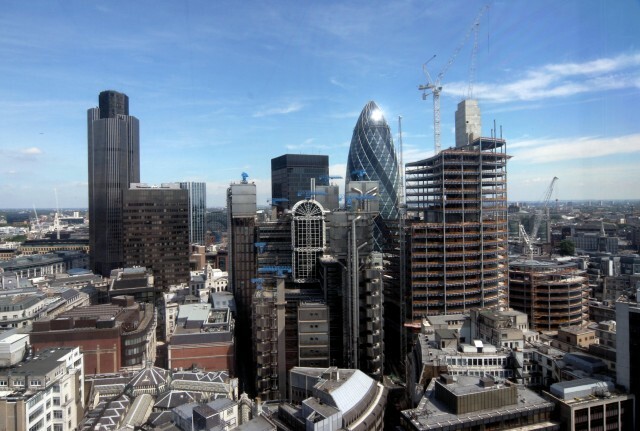 At the same time however, London is vulnerable to climate imacts – some as a result of its location, others (such as surface water flooding and the urban heat island effect) a result of its urban development. London is currently very well protected against tidal flooding, but has a lower and more varied standard of protection against fluvial flooding, along with a relatively low standard of protection against surface water flooding. The risk of tidal flooding in London is very low due to tidal flood defences in the Thames Estuary. The Thames Barrier has been operational since 1982 and has been closed over 100 times to protect London from flooding. In addition to stopping tidal surges from entering central London, closing the barrier can also ‘keep out the tide’ and provide additional space for high river flows after heavy rainfall in the upper Thames catchment to the west of London. An extreme scenario however could potentially inundate the entire floodplain on the Thames Estuary, as tidal water levels may overtop all of the defences. 15 per cent of the capital’s surface area lies on the floodplains of its rivers. This means that an estimated 1.25 million people at risk from flooding. Nearly half a million properties have also been identified as at risk – although it is important to note that over 80 per cent are at ‘low’ flood risk, and around 83,000 properties are at ‘moderate’ or ‘significant’ risk. There is also a substantial proportion of the capital’s schools, transport network, and emergency services are at tidal and fluvial flood risk, though most are well protected. Changes in levels of rainfall are expected to impact on surface water flooding, sewer flooding and groundwater flooding. Surface water flooding (also known as pluvial flooding) occurs when heavy rainfall overcomes the drainage system. 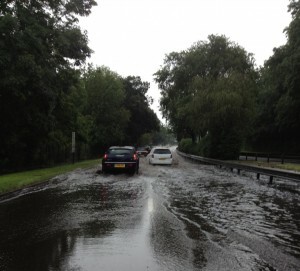 This type of flooding is exacerbated in London due to the lack of permeable surfaces caused by development. It is estimated that the capital has more than 800,000 properties are currently at risk of surface water flooding. The Climate Change Risk Assessment rainfall analysis suggests that heavy rainfall events will increase in intensity, especially during the winter months. Further development due to population increase is projected to place additional pressure on surface water drainage. The Drain London case study looks in more detail at how surface water flood risks for London have been assessed. The temperature at the centre of a large city can be several degrees higher than in the surrounding rural areas, which is known as the Urban Heat Island (UHI) effect. Several factors contribute to the development of this urban microclimate, including greater absorption and storage of short-wave solar radiation by the urban fabric during the day; surface water being drained away and unavailable for evaporative cooling; and anthropogenic heat emissions (such as exhaust air from air-conditioning systems). The magnitude of the UHI effect is dependent upon the interplay of local conditions including land coverage, built form, wind patterns, cloud cover and relative humidity. In the case of London, the UHI effect on night-time temperatures can be up to 10 °C. 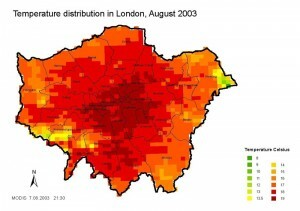 By the 2050s, one third of London’s summer may exceed the Met Office current heat wave temperature threshold (Daytime temperature of 32°C and night-time temperature of 18°C). Land use planning has a notable effect on the number of people exposed to heat waves, but is much less important than the change in climate. A threefold increase in anthropogenic heat emissions (e.g. from air conditioning) on top of climate change has a negligible impact on maximum daytime temperature, but would raise minimum night-time temperatures by about 0.5°C which would aggravate heat stress. Overheating of commercial and other properties can arise due to a number of factors, but can be especially acute in modern highly insulated lightweight buildings and also highly glazed buildings. The risk of overheating is likely to increase if temperatures increase. The number of days per year when overheating could occur in London is projected to rise from a baseline of 18 days to between 22 and 51 days by the 2020s (central estimate is 33 days). In the UK, large numbers of properties are at risk of subsidence. 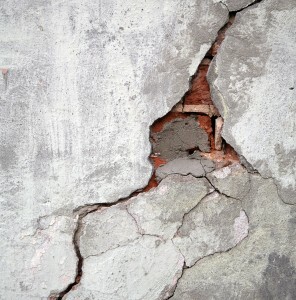 In 2009 there were about 30,000 notified domestic subsidence claims, with a total value of £175m. London is particularly prone to subsidence due to its clay soils with high shrink-swell potential. Changes to the present shrink-swell pattern may occur due to higher temperatures and changes in rainfall patterns. This may also have a knock on effect on water supply leakage due to damage to pipes, exacerbating water shortage issues (see the Natural Environment section). However, the range in the projections is wide, reflecting the uncertainty in the projected changes in summer rainfall.